It’s that time of year again—election time! 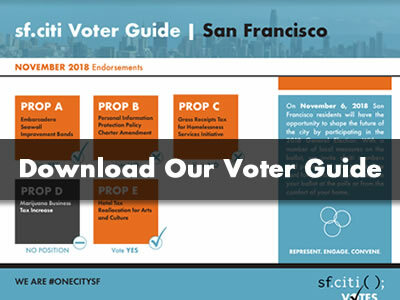 As with previous election cycles, sf.citi is offering our evaluation of the local propositions San Francisco voters will be asked to decide on in the November 2018 election. We hope our recommendations help you make sense of November’s ballot initiatives, and invite you to take the sf.citi slate card with you to the polls (or refer to it as you fill out your ballot from the comfort of your home). Whether or not you agree with our recommendations, we encourage all San Francisco residents to contribute to the civic process, have a say in our city’s future, and vote on November 6th. About Prop A: The measure would create $425 million of bonded debt for the City and County of San Francisco to pay for major repairs and upgrades to the crumbling Embarcadero seawall. The city’s 100 year-old Embarcadero seawall underpins and protects an estimated $100 billion in property and infrastructure that would be at risk should a major earthquake or flood occur – with rising sea levels, this is all the more likely. Long overdue for repairs, we support this measure to improve the seawall which protects utilities, transit infrastructure, residents, and businesses along the Embarcadero, Financial District, parts of SOMA, and many more locations in the eastern half of the city. Home to San Francisco’s economic core and many of its crucial transit hubs, including BART and Muni tunnels, the seawall is a problem we need to address before it’s too late. About Prop B: Known as the Privacy First Policy, this measure would create and integrate a set of privacy-protective principles into city law. It lays out a number of personal data protection protocols that businesses would have to respect in order to get a permit for doing business in or with the City. About Prop C: Known as the Our City, Our Home initiative, the measure would levy an average of about 0.5 percent in gross receipts tax on corporate revenues above $50 million. The estimated $300 million raised would be used to further fund homelessness services, primarily programs aimed at helping people access permanent supportive housing. Costing up to $300 million annually, Proposition C is the largest proposed tax increase in San Francisco history. According to a recent City Controller report, this tax will result in 725-875 lost jobs per year, and increase by one-third the $900 million dollars currently being collected in business tax revenue annually -- all adding up to an overall negative economic impact for our City. Additionally concerning, the tax has no sunset clause and could mean a loss of $200-240 million in GDP locally for the first 20 years in effect. The issue of homelessness is the most pressing crisis facing San Francisco. While sf.citi has repeatedly supported policy and tax measures that would contribute to a solution, including Affordable Housing for All in the June 2018 election, we believe Proposition C is fraught with concerning economic implications that outweigh its good intentions. We believe that the solution to this problem requires a collaborative approach by all stakeholders in the community, including elected officials, the business community, and the nonprofit community—an approach we at sf.citi are committed to, but, unfortunately, was not taken during the creation of Proposition C. The issue of homelessness affects the most vulnerable members of our community and it is imperative that we work together as a community to create the most effective solutions possible. For these reasons, sf.citi recommends “no” on Proposition C.
About Prop D: The measure would place an additional gross receipts tax on cannabis businesses. As a general tax, the money collected would go into the general fund and generate a $7-16 million annual revenue source according to the City Controller. For retail cannabis shops, the tax would be 2.5 percent on the first $1 million in revenue and 5 percent on revenues above $1 million. Non-retail cannabis businesses would be taxed 1 percent on revenues up to $1 million and 1.5 percent on gross receipts above $1 million. The tax would go into effect at the start of 2021. We take no position on a new business tax proposed for another industry. About Prop E: The measure would reallocate about $32 million of the approximate $370 million generated by the existing hotel tax to arts and cultural organizations and projects in the city. The city already levies a 14 percent tax on hotel rentals, the proceeds from which are deposited into the general fund. By passing this measure, a portion of those proceeds would be directed towards arts and cultural services. This measure does not create a new tax or raise the current hotel base tax, and instead ensures that existing revenue would be dedicated to arts funding for the city. In its current form, the Board of Supervisors must annually allocate the money raised by the hotel tax to arts and cultural services. In a time when many artists and arts organizations are struggling with funding and face displacement in the city, we support this allocation of the hotel tax to ensure a stable foundation for San Francisco’s unique arts and cultural offerings.